Are Custodial Parents the Responsible Party for Medical Bills? Anyone who has raised children knows that the costs of health insurance, broken bones and the latest school-spread bugs can be significant. States take these issues into consideration when ordering child support in a divorce. The burden of paying for medical care only falls entirely to one parent – either custodial or noncustodial – in isolated circumstances. 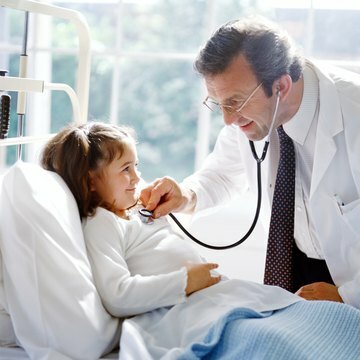 Most states will address your children's health insurance needs in your divorce decree. Some, like Texas, issue a separate order. This order often requires that the noncustodial parent provide for the policy, particularly if he has access to coverage through his employer. The parent must typically pay any premiums in addition to his child support obligation. Other states, such as Massachusetts, allow you to deduct the cost of premiums from your income -- and child support is then calculated on the balance. Medical bills that are not covered by insurance are typically – but not always – apportioned between parents. Rules for this can vary considerably from state to state. For example, in Massachusetts and New Jersey, the custodial parent pays the first $250 per child per year, with the balance divided between the parents in proportion to their incomes. The first $250 is considered covered by the child-support obligation. Connecticut caps out this covered portion at $100 per child, and Indiana sets it at 6 percent of the child-support obligation. Texas usually divides all uncovered medical bills equally between the noncustodial parent and the custodial parent, unless there's a significant difference in their incomes. What Is Included in Unreimbursed Medical Expenses for a Divorce? The law has historically struggled with the fact that minor children continue to need financial support after their non-custodial parents die. Methods for dealing with the problem vary from state to state and legislation frequently changes as lawmakers try to come up with solutions, some of them imperfect. Texas takes the welfare of its children seriously. If you're facing divorce in this state and you have children, the proceedings will involve more than determining custody and child support. State law, such as the Texas Family Code, includes provisions for your children's medical care, including health insurance, in addition to a child support order. If you fail to provide health insurance for your child in violation of a court order, the court can fine you up to $500 and send you to jail for six months.